Description: Lead engine on a westbound BNSF coal train, pulling primarily TXUX rotary gonds. This train was highballing at near 50 mph. Description: A lone SD70MAC pulls a load of empties into Lincoln on a pretty day in mid-may. 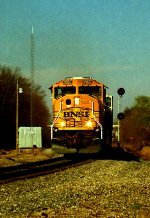 Description: BNSF lashup heads west through Kansas Street. Description: Heading onto the Ft. Scott sub. Description: Odd to see BNSF and UP units together like this. It makes it wierder that its in NS' Forest Yard. Description: Heading west about to cross the UP diamond. Description: A TXUX coal train smokes it up passing the signals at the south end of Siloam Springs as it rolls into the downhill toward Watts. Description: A nice H2 "Chili MAC" rolls NS #733 northward through Austell, GA. Description: Cohasset Coal loads head east across the Red River Valley. Description: A pair of SD70MACs leads a loaded coal train witha ACe pushing at the back, the leaders are a Heritage II and a Executive MACs. Title: BNSF 9965 is seen passing under the 27th street bridge. Description: BNSF 9965 leads another orange 70MAC with a loaded coal bound for the Wood River Power Plant. A picture perfect orange color match up with the changing leaves along the bluffs of Foley, Mo. Title: Empty Black diamonds head Nb. Description: NB empty coal train rolling up the K line at a slow pace due to recent track work.